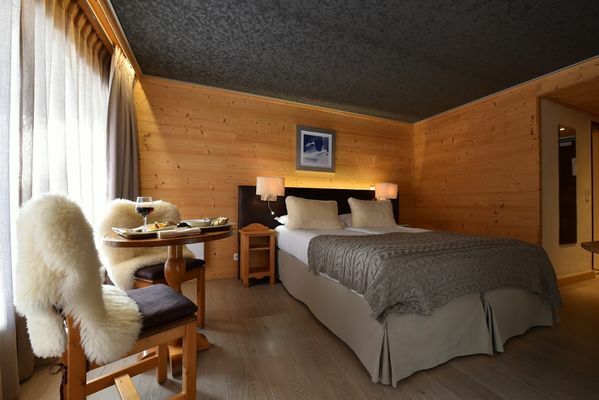 This friendly family-run chalet hotel is ideally located between the vast ski area (50 m from the ski lifts) and the GR5 and Tour of Mont Blanc hiking trails, in a unique and peaceful setting opposite the Mont Blanc range. The rooms, decorated in a subtle combination of tradition and modernity, boast superb views of the surrounding mountains. 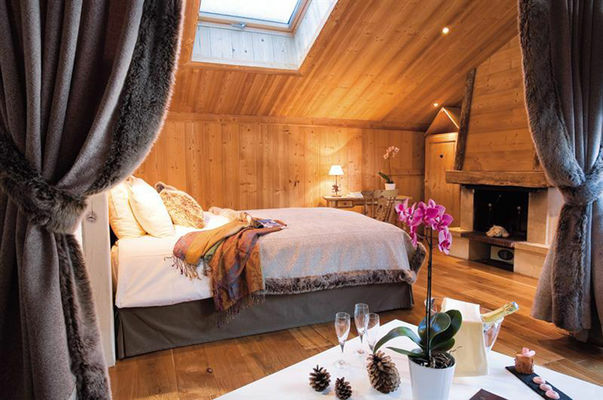 Recently renovated, the 40 comfortable bedrooms, for 2 to 4 people, are spread over 3 floors. > RESTAURANT: open every day, “LaTrabla” serves a choice of local specialities and refined contemporary cuisine. Enjoy a selection of local produce and home-made dishes around the central fireplace. > BREAKFAST: enjoy a buffet breakfast including a wide choice of drinks, home-made dishes, pastries etc. > CHILDREN: cots available on request. Games room on site. > RELAXATION AREA: relax and recuperate in the sauna and Jacuzzi after a day on the slopes or a hike in the mountains. > SKI ROOM: in summer and winter, leave your boots and wet clothes in the heated ski room where they will dry overnight. > Free PARKING nearby, unattended. > RENTAL OF EQUIPMENT: rent your ski and snowboard equipment (and any other winter sports equipement) , or E-Bike in the hotel, and at preferential price. • In rooms with parquet flooring only. * The reception is open from 7:30am to 11pm.